Massereene's Tiarnan McLarnon put up a tremendous fight before going out to Spain’s world number 31 Angel Hidalgo in the last 16 of the Spanish Amateur Championship at La Manga. The 26-year old was in superb form in the first round, rattling in the birdies in an 8 and 6 demolition of Frenchman Thomas Dorier as Naas' Jonathan Yates gave England's Gian-Marco Petrozzi a very good game before losing 1 up. McLarnon took the lead early in the match but made some errors and coupled with some great play by the Spaniard, he found himself four down heading down the stretch. But he refused to go down without a fight and after winning the par-three fifth (their 14th) in birdie, he hit the sixth in two and forced Higaldo to get up and down for birdie and a half in birdie fours. Three down with three to play, McLarnon then applied more pressure by holing a nine footer for birdie on the seventh to be just two down. Hidalgo then got nervous and three-putted the eighth to see his big lead reduced to just one hole playing the last. Sadly for Ireland’s hopes of fifth win — previous Irish winners were Philip Walton (1981), Mick Quirke (1987), Darren Clarke (1990) and Reeve Whitson (2013) — McLarnon’s two-iron out of the trees came up 20 yards short and while he pitched to four feet, his par putt swung across the hole and lipped out. Hidalgo progresses to meet England’s Alex Fitzpatrick in the quarter-finals. 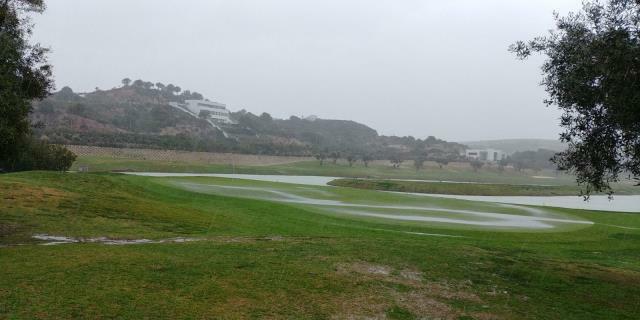 In the women’s event at Montecastillo Golf & Sports Resort in Cadiz, officials reduced first round matches from 18 to just 12 holes but high winds and torrential rain forced a suspension of play until today. Lisburn’s Paula Grant is two up after two holes against Sweden's Beatrice Wallin and Lurgan's Annabel Wilson three up after seven against Denmark's Sofie Kibsgaard with Killarney's Valerie Clancy yet to start against French star Lou Vrain. FITZPATRICK, ALEX (Eng) v HIDALGO, ANGEL (Esp).